5. Hear Con Ed President Timothy Cawley and NY Public Service Commission Chair John B. Rhodesgive keynote speeches on the challenges and opportunities in transforming New York’s heating sector to clean, efficient heat pumps. 4. It’s affordable! PSEG Long Island, Orange & Rockland Utilities and Sierra Club Atlantic Chapter have donated to a grant fund for partial scholarships – we’ll work with you to get you here. Email us at nygeoinf@gmail for more information. 3. 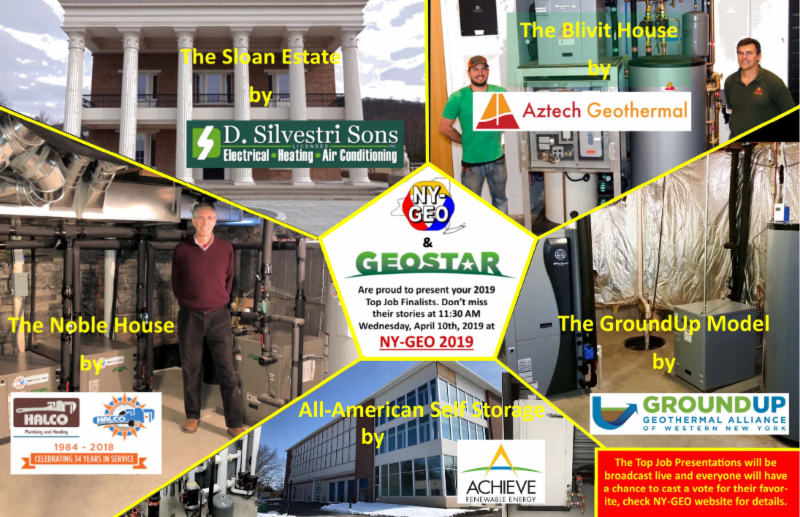 Witness and vote on the Top Job competition, where 5 projects showcasing the breadth and versatility of geothermal installations battle it out to be this year’s winner. Top Job will also be Live Streamed this year at https://ny-geo.org/pages/2019-top-job-competition. 4. Visit more than 30 exhibitsfeaturing innovative projects and products from cutting edge companies and organizations. 1. Meet upwards of 340 fascinating people who are excited to move New York into heating & cooling renewably without fossil fuels and their associated greenhouse gas emissions. Join us for the fifth annual NY-GEO Renewable Heating & Cooling Conference at the Rivers Casino & Resort in Schenectady, New York – next Wednesday and Thursday – April 10th & 11th, 2019! Thanks to all who have already registered ! Why not forward this note to your colleagues and encourage them to join you at NY-GEO 2019? Join us for a fantastic program that will help policy makers, installers, organizers, architects, clean energy activists, contractors, building owners and managers, engineers and more to plug into the renewable heat momentum building in New York and across the northeast! On December 13th, the NY Public Service Commission carved out 1.5 GWh (=5TBtu) in savings from heat pumps in their energy efficiency order. By their estimate, this means 83,000 buildings will switch from fossil fuel heating to heat pumps by 2025. GAME ON ! For Building Professionals: NY-GEO 2019 provides 5 continuing education credits for building professionals, including BPI credits, AIA credits for architects and ACEC credits for engineers. Three of the classes will be taught by Ed Lohrenz – of GeoOptimize, and Jay Egg will do a CEU class on Geothermal for Skyscrapers. Brian Urlaub of MEP Associates will focus on Campus Applications. Become a 2019 member of NY-GEO and get a 10% discount on registration exhibition space and a $100 discount on a sponsorship. Associate non-voting memberships in NY-GEO are available for only $35 and bring a 5% registration discount. The GeoStar Top Job competitionis one of the most exciting and interesting events at our annual conference. On Wednesday morning you can hear five 10 minute presentation from our finalists, showcasing a full spectrum of remarkable geothermal heat pump installations. On Thursday, to close out the conference, the 2019 Top Job Winner will be chosen. Top Job might be your Best Bet for learning about geothermal technology.